Sunday morning we were again on our way in the dark towards Arches National Park. 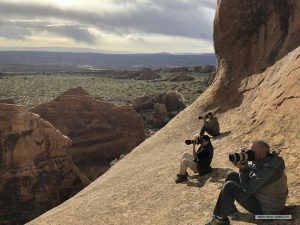 After a short hike we came to Landscape Arch where we were able to claim nice perches from which we could compose and frame the arch. This is an amazingly beautiful structure, long and getting rather thin along the top. I wasn't intending to use the Chamonix 4 x 5 quite yet but it was clear right away that the two lenses that I had for the GFX wouldn't frame the scene the way I wanted and since the rib of rock we were set up on was only about six feet deep, I couldn't move forwards or back. The wind was calm and the composition was perfect for my 125mm on the 4 x 5 so out of my pack it came. I exposed the image on a sheet of Fujifilm Provia 100. As Robert told us, he had yet to see the perfect conditions we had there this morning, with soft first light illuminating the arch and dynamic skies behind. The Provia worked very nicely as it renders the blue in the sky so vividly against the warmth of the first light hitting the arch. While waiting for the light from our perch, I pulled out the GFX and captured the cool formation in the opposite direction of the arch. Not sure it has a name yet, looks like the bow of a ship that's smiling? After Landscape Arch we scrambled up the canyon a ways to Tunnel Arch. We climbed through the arch out onto a somewhat steeply sloped ledge kinda high above the canyon to make the next image. The scene before us, with perfect light and dramatic skies over more wonderfully formed rocks with red and orange was irresistible. Glad the soles of my shoes were sticky! For the evening outing we headed to Dead Horse State Park. Conditions were demanding with the wind howling to the point that I was holding on to my tripod to steady myself. 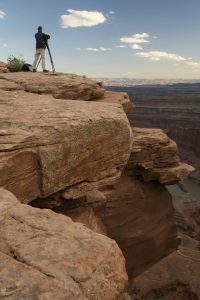 I was standing at the edge of the canyon wall high above the Colorado river hoping for the light to work its magic on the vast scene in front of me. The direction I was facing, fortunately with the wind into my face, just wasn't lighting up the way I was hoping. I looked away from the Colorado to look to see if I could get a clue as to what the light might be doing and was able to capture the next photograph in the slides above. I was probably out there for an hour and a half in that wind and was feeling pretty beat up and tired. 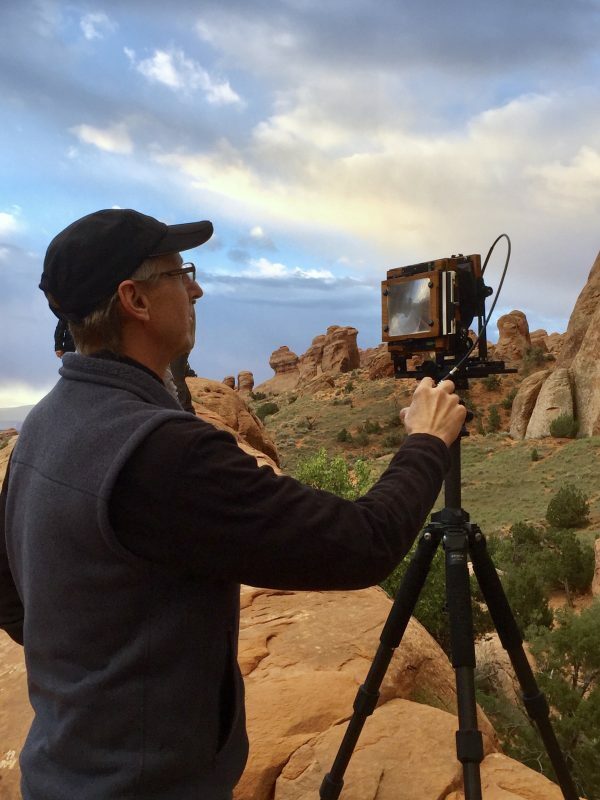 In my view, in my tired condition, the light was not going to happen and I was happy with the one composition I was able to get so I decided to pack up and head back to my car. As I was walking off I heard Robert calling out to me. I turned and he asked where I was going. I told him I was beat and was headed back to the car. He called me over and excitedly told me that in five minutes the last light would light up top of the canyon edge which would look amazing against the blue and magenta hues of the scene below. Thank you Robert, spot on! A wonderful full day, it was time to head back for some much needed rest. For high res images, click here. Thank You Lesa! Yes we will be there! It’s coming up soon. We are staying offsite nearby this year so I don’t know that I’ll catch you there for sunrise but I look forward to connecting somewhere in that beautiful place!